It is another bright and sunny Sunday morning here and time to visit the Playground for another challenge. It does sound churlish to complain about the heat but I would actually prefer slightly cooler temperatures - when I get hot sitting still I'm afraid it's too much for me but maybe Parsnip will have the paddling pool out!! I was lucky enough recently to win the Snippets prize so that's what I've used in the main for my card this week together with some 'sequins' die cut using a prize won quite a while ago. 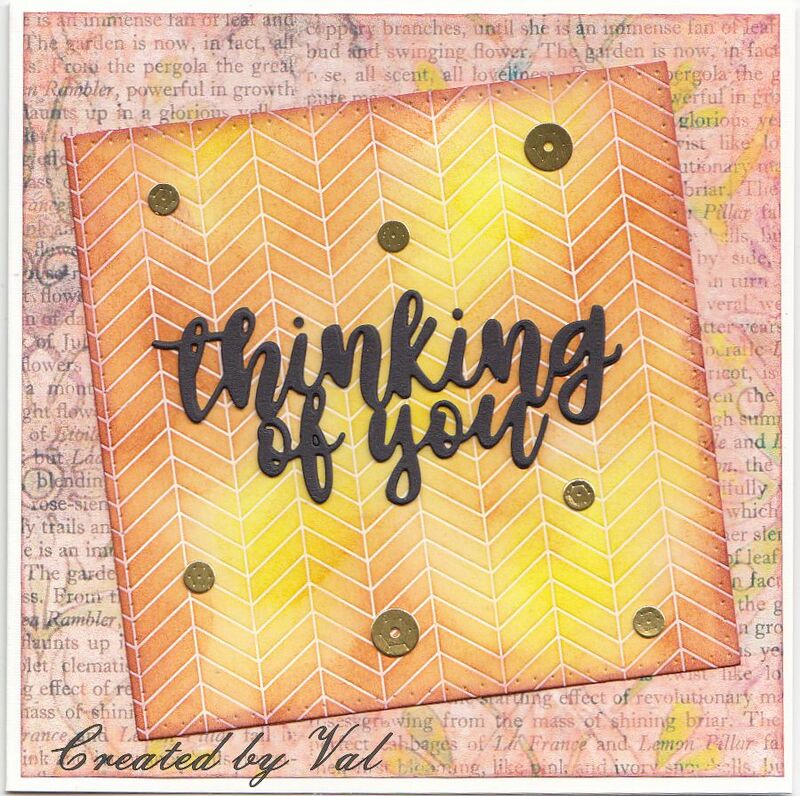 Every fortnight the lovely Di makes a card using the current prize for our inspiration and of course to show us what we could own if our name comes up in the Random Number draw. This time there is a super get well card featuring a poorly pooch using just one of the themed stamps in the set and of course we all need to wish someone well now and then don't we. Why don't you raid your snippets and visit the playground with a picture of what you make to be in with a chance. Anyway for my card I found a fairly large snippet of text patterned paper and chose suitable colours of Distress ink to sponge onto one of the resist cards which were part of my win - details below. I then found a snippet of black card to cut out a phrase from the other part of the prize which was a set of word dies - again details below. I cut a square from the inked card, added the words which I actually cut twice and layered up for strength and a bit of dimension, before popping it onto the background at a jaunty angle. Finally I die cut some 'sequins' from a scrap of gold card and scattered them randomly. 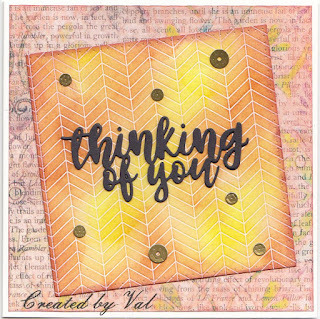 A fabulous card Val, I love the colours. Oh Val, this is just brilliant! And how lovely to see you using your prize right away as well. Many thanks for your very kind words too. Congrats on using your winning goodies to make this week's snippets card! I love the texture in both background pieces, and especially like the tilted panel! Good luck this week again and stay cool if you can! such a lovely card made with your prize. Super resist technique and inking. Love the impact this card gives. Great use of your wins too.didn't even know there was a die out there for cutting sequins! Hugs Mrs A. This does look swell. That centre piece really has the Wow factor especially with the black lettering. Hugs Mrs A.